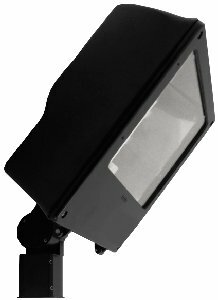 RAB Lighting Floodinator with slipfitter mount allows easy pole top mounting for aiming flexibility. Fits 2-3/8" OD tenon. Factory wired with QT CWA-HPF ballast. Adjustable aiming over 180 arc. Mounting can be locked securely in place. Lamp supplied. UL listed: Suitable for wet locations. Suitable for mounting within 1.2m (4ft) of the ground. Reflector: High quality anodized aluminum eliminates redirected energy to prolong lamp life. Contoured for maximum horizontal and vertical beam dispersion. Finish: Chip and fade resistant polyester powder coating. Housing: One-piece die cast aluminum with die cast door frame held captive when opened. Lens: Thermal, tempered shock resistant glass, 5/32" thick. Lens gasket: High temperature extruded silicone set in die cast retaining groove. Remains in place during relamping. EPA: 4.2. Quad tap: Fixture works with 120, 208, 240 and 277 Volts. The unique RAB Floodinator is protected by U.S. Patents D567,980 and D572,396; China Patents ZL200730149207.6 and ZL200730149212.7; Taiwan Patent D127,687 and Canada Patents D121,990 and D121,988. Porcelain socket pulse rate 4 KV, 1500 watts and 600 volts, reinforced with cat's eyes for added durability. Silicone and fiberglass #14 gauge socket leads rated for 200 degree C. Plated screw shell designed to resist corrosion with spring loaded center contact. Recovery act (arra) compliant: This product complies with the 52.225-21 "Required Use of American Iron, Steel, and Manufactured Goods - Buy American Act - Construction Materials (October 2010). This product is a COTS item manufactured in the United States, and is compliant with the Buy American Act and Trade Agreements Act. Gsa schedule: Suitable in accordance with FAR Subpart 25.4. If you have any questions about this product by RAB Lighting, contact us by completing and submitting the form below. If you are looking for a specif part number, please include it with your message.